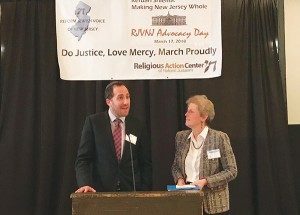 Reform Jewish Voice of New Jersey (RJVNJ), an arm of the Religious Action Center of Reform Judaism, is a means for Reform Jews across our state to join together with a strong and effective voice. Through action alerts, advocacy days in Trenton, house meetings, participation in marches and rallies, training events, and more, we engage in issues that matter to us as Reform Jews and as residents of New Jersey. We bring together congregations, individuals, and affiliate organizations and invite you to add your voice to our work. Now more than ever we must heed the call to seek justice, love mercy, and march/speak out proudly together. Reform Jewish Voice of New Jersey cochairs Rabbi Ethan Prosnit of Temple Emanu-El in Westfield and Liz Cohen of Temple Beth El in Hillsborough.